Woke up after 7 hours of sleep. I had the cup of white tea that my husband left for me before he went to work. Woke my daughter and got her ready for school. 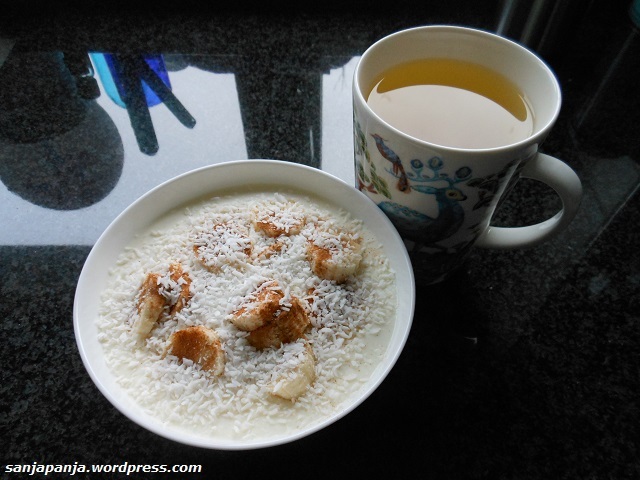 Breakfast: Yogurt, banana, cinnamon and shredded coconut with a cup of white tea. Walked back to school to bring my daughter home from school. 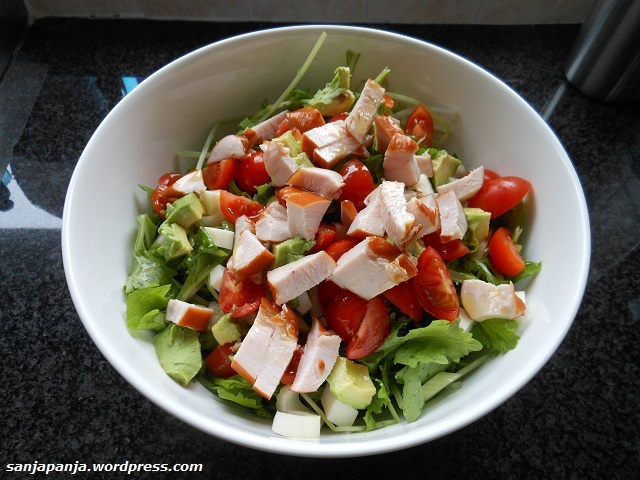 Lunch: Turnip greens, celery, cherry tomatoes, avocado, goat’s cheese, smoked chicken breast, apple cider vinegar and extra virgin olive oil. Walked with my daughter to the last time at FunGym. 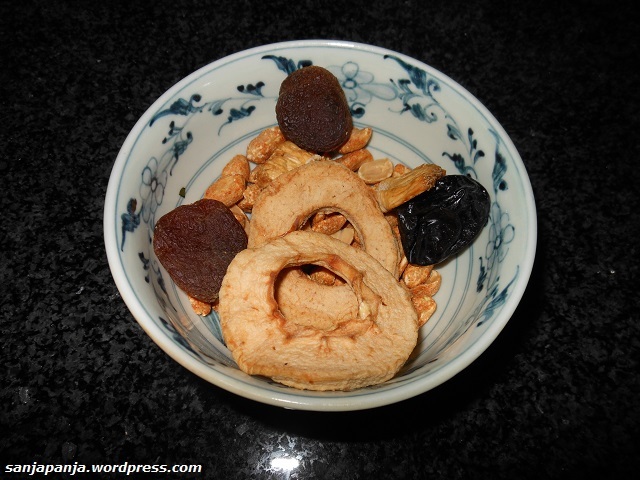 Snack: Dried fruit and dry-roasted nuts. Walked back to FunGym to bring my daughter home. Today it rained but there was almost no wind, so I don’t really mind. Dinner: My husband suggested that we order pizza from New York pizza again. 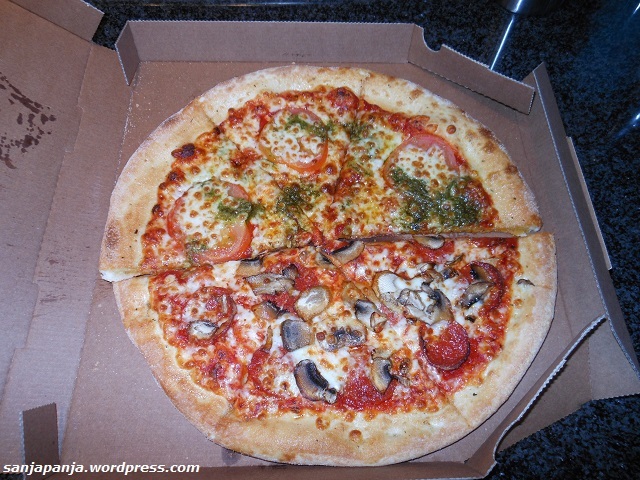 I had 1/2 POMMODORI PESTO PIZZA and 1/2 PEPPERONI PERFECTION PIZZA. This entry was posted in food, life and tagged 7 hours of sleep, almonds, apple cider vinegar, avocado, banana, breakfast, cashew nuts, cashews, celery, cherry tomatoes, chicken, cinnamon, coconut, cup of tea, daughter, dinner, dried fruit, dry-roasted almonds, dry-roasted cashew nuts, dry-roasted cashews, dry-roasted mixed nuts, dry-roasted peanuts, extra virgin olive oil, food journal, fungym, goat's cheese, husband, lunch, New York pizza, no wind, olive oil, pepperoni perfection, pommodori pesto pizza, rain, raining, school, shredded coconut, smoked chicken, smoked chicken breast, snack, tea, turnip greens, vinaigrette, vinegar, walk, walking, walking to school, white tea, yogurt. Bookmark the permalink. YUM! 🙂 Always such a treat to see your beautiful photos, Sanja. Thank you! Do you make your own smoked chicken breast? Or do you buy it cooked and then add it to the salad? As always, I’m forever on the hunt for tasty, healthy meals. And your blog continues to delight. Happy New Year!